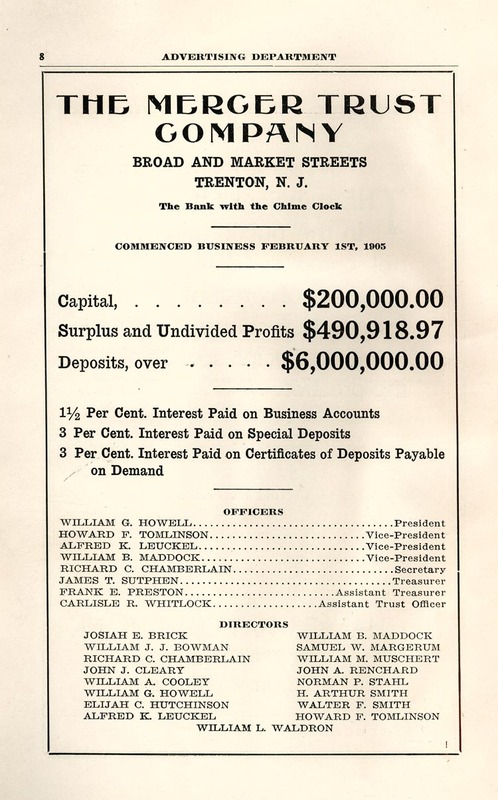 The Mercer Trust Company, Broad and Market Streets, Trenton, N. J. The Bank with the Chime Clock. Commenced Business February 1st, 1905. JOSIAH E. BRICK, WILLIAM J. J. BOWMAN, RICHARD C. CHAMBERLAIN, JOHN J. CLEARY, WILLIAM A COOLEY, WILLIAM G. HOWELL, ELIJAH C. HUTCHINSON, ALFRED K. LEUCKEL, WILLIAM B. MADDOCK, SAMUEL W. MARGERUM, WILLIAM M. MUSCHERT, JOHN A. RENCHARD, NORMAN P. STAHL, H. ARTHUR SMITH, WALTER F. SMITH, HOWARD F. TOMLINSON, WILLIAM L. WALDRON.